A pool can be an outdoor oasis for the whole family but choosing the right pavers is essential to the long-lasting beauty of the space. The pavers surrounding the pool are exposed to the elements, chlorine, deck furniture, and high traffic. 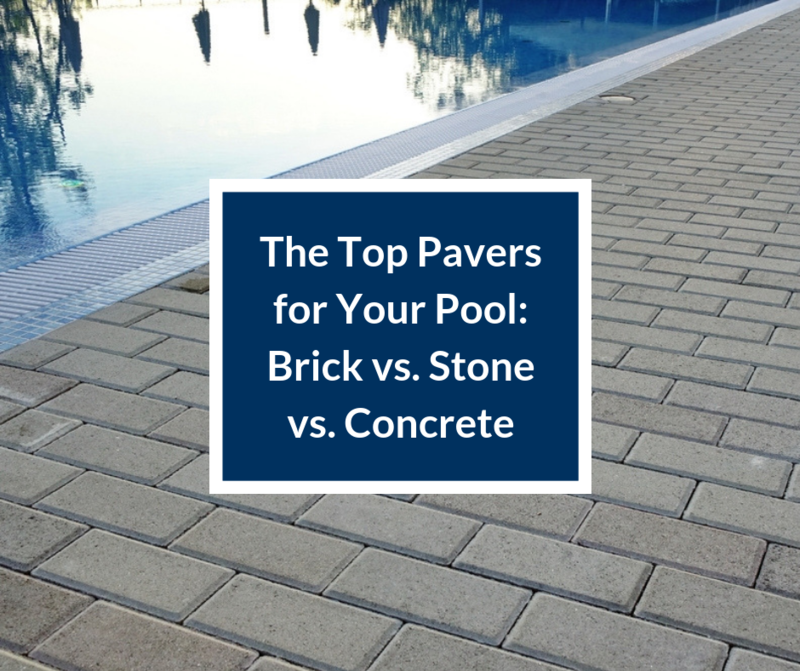 Concrete, brick, and stone are the most popular pool paver options. Each one offers its own list of benefits and drawbacks to consider when finding the best one for your space. There are many factors that play a role in finding the right pool pavers. Style, finish, durability, heat retention, coping, maintenance, and cost are all contributing factors in selecting the ideal pool pavers. 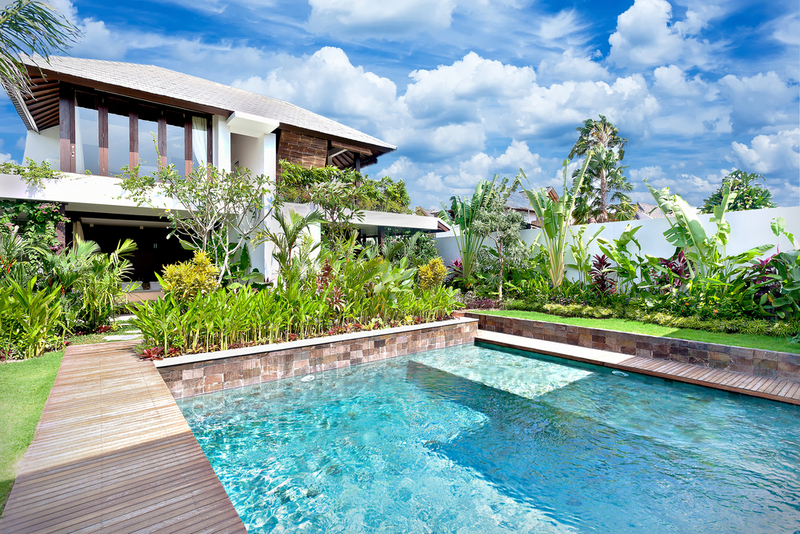 Style: A pool is an important focal point of any back yard. The pool deck is a large hardscape that will draw the eye to the pool itself. As such, it is imperative that the look of the pavers coordinate with the general style and color scheme of the home exterior and the natural surroundings of the space. Durability: A pool deck is typically an expansive space and installing the pavers can be costly or time consuming. Select pavers that are built to hold up to many years of use to ensure the space will continue looking great for many years to come. Heat Retention: Pool decks are typically exposed to direct sunlight. The more heat they retain, the hotter they will feel on bare feet. Consider selecting pavers that will stay cooler under foot if you live in a hot climate. Maintenance: Every pool paver will require some level of maintenance. Consider the amount of time you have available to help decide which material makes the best fit for your space. Concrete is a very low-maintenance paver option while natural stone products can require more maintenance to keep looking great. Coping: The coping is the border along the pool. Concrete and brick are manmade materials, making it easy to run the product right up to the pool edge by installing coordinating coping. This is especially important for pools that have curved edges. When making a final selection for the pool deck material, check out the coordinating coping and consider if you can get matching coping or if a complementary material will be necessary to complete this part of the installation. Budget: Any home improvement project has a budget. The initial cost of the material, installation prices, and longevity will all play a factor in determining which material will work within your designated budget. Brick is a manmade material that is highly resistant to the elements, making it a popular choice for a variety of outdoor applications. If a home is brick, using brick for pool decks, patios, and walkways is a fashionable way to complement the timeless design of the home. Brick comes in a wide array of color tones and stands up to chlorine, salt, and moisture present around a pool. Their smooth yet gritty texture helps to prevent slipping, even when they are wet. Although brick is durable in its bare state, it can be made even more durable with the addition of a sealer. In addition to offering a classic look, brick is also a cost-effective way to lay a large pool deck. This manmade material is also an environmentally friendly choice. It is not mined like natural stone, so quantity and consistency are never a problem. Because it is manmade, it is also easy to find a variety of shapes, including pieces specifically designed for the coping surrounding the pool, ensuring a consistent look from edge to edge. Natural stone brings an authentic elegance to the design of a pool deck. Granite and travertine are just a couple of the natural stone paver options suitable for pool decks. Each type of natural stone will carry its own benefits and drawbacks. In general, natural stone is slip resistant and won’t conduct as much heat as concrete and brick, keeping it cooler beneath the feet. Natural stone is a porous material that needs sealed to prevent staining and sun damage. Check with the sealer manufacturer to find out how often the natural stone pavers will need resealed. Some suggest resealing multiple times a year while others make it an annual chore. The cost of natural stone varies widely based on the type of natural stone. Concrete is a popular choice for outdoor walkways, driveways, decks, patios, and pool decks too. This naturally durable material stands up to extreme climate areas, making it suitable to climates where hot temperatures or frequent freezes take place. Concrete pavers are tightly packed for a smooth surface and incredible durability. Concrete is naturally resistant to salt damage, making it an ideal choice for surrounding a salt water pool or a chlorinated pool. The durable solution resists staining and water absorption, making them strong enough to hold up to all that life brings to a pool deck. Concrete is easy to color and stamp, making it easy to get a custom look out of a concrete pool deck. A pool is a great way to introduce recreation, beauty, and value to the back yard. Once the pool is installed, a pool deck is required to provide access to the pool. The right pool pavers will deliver style, comfort, and durability to the area while providing a space that family and friends can gather. When choosing the right pool deck pavers for your home, consider the elements, the style of the home, and the amount of maintenance required to keep them looking great.